If no abnormality is found when inspecting parts, check the skid control ecu and check for poor contact at the ground points. 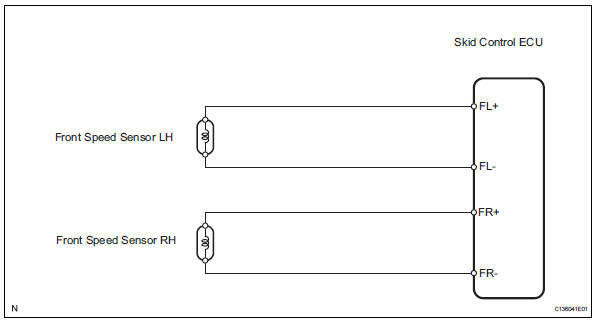 If a dtc is displayed during the dtc check, check the circuit for the dtc listed in the table below. For details of each dtc, refer to the page indicated. Even after the trouble areas are repaired, the abs warning light will not go off unless the following operations are performed. Drive the vehicle at a vehicle speed of 50 km/h (31 mph) and keep depressing the brake pedal firmly for approximately 3 seconds. 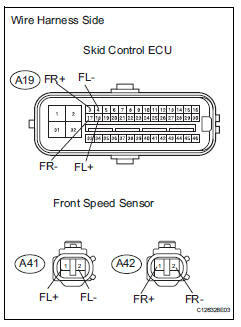 The speed sensors detect the wheel speeds and send appropriate signals to the skid control ecu. 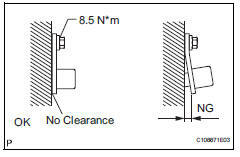 Speed sensor rotors have rows of alternating n and s magnetic poles, and their magnetic fields change as the rotors turn. The speed sensors detect those magnetic changes and send pulse signals to the skid control ecu. The ecu monitors the wheel speeds through these pulse signals to control the abs control system. 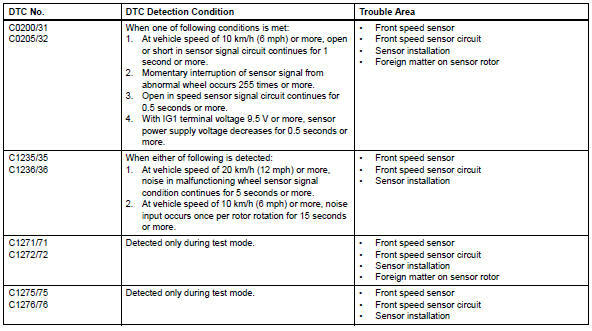 Dtcs c1271/71, c1272/72, c1275/75 and c1276/76 can be deleted when the speed sensor sends a vehicle speed signal or the test mode ends. Dtcs c1271/71, c1272/72, c1275/75/75 and c1276/76 are output only in the test mode. 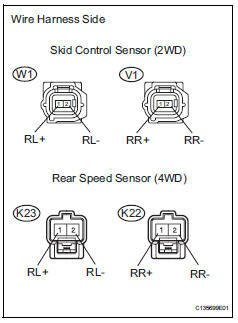 Dtcs c0200/31 and c1235/35 relate to the front speed sensor rh. 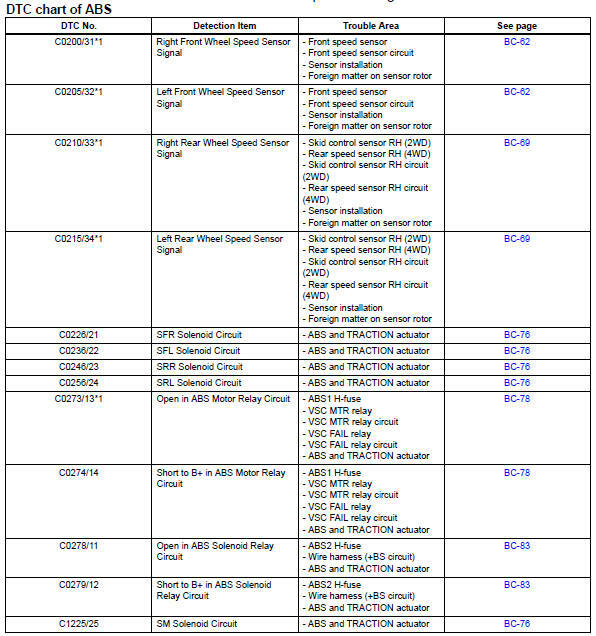 Dtcs c0205/32 and c1236/36 relate to the front speed sensor lh. 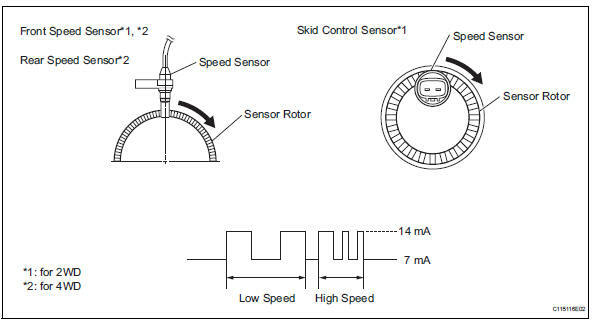 Check the speed sensor signal in test mode after cleaning or replacement (see page bc-28). 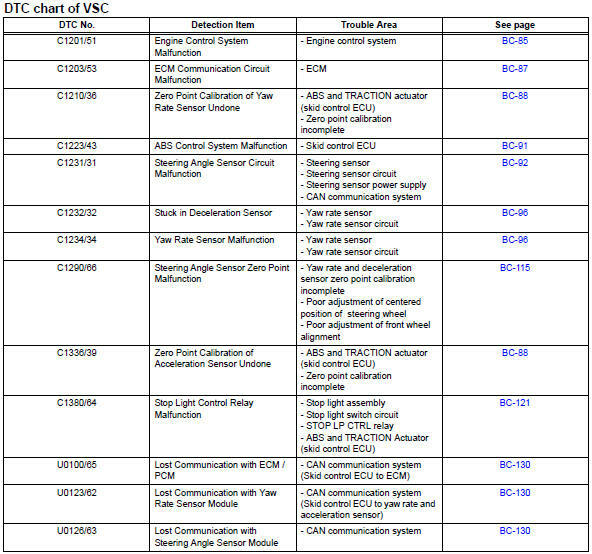 Using the data list of the intelligent tester, check for any momentary interruption in the wire harness and connector corresponding to a dtc (see page bc-23). 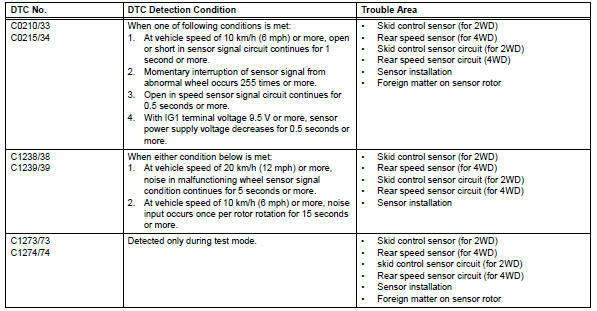 Check the data list for proper functioning of the front speed sensor. Ok: there is almost no difference between actual wheel speed and displayed speed value. There is a tolerance of +-10% in the speedometer indication. Perform a test mode inspection and check for dtcs (see page bc-28). Clear the dtc(s) (see page bc-47). Drive the vehicle at a speed of 20 km/h (12 mph) or more for at least 60 seconds. Check if the same dtc(s) is output (see page bc-47). Check that the speed sensor installation bolt is tightened properly. Ok: the installation bolt is tightened properly, and there is no clearance between the sensor and front steering knuckle. If the installation portion of the sensor is dirty, clean it and reinstall the sensor. Check the speed sensor after the speed sensor replacement (see page bc-28). Remove the front speed sensor. Ok: no scratches or foreign matter on the sensor tip. 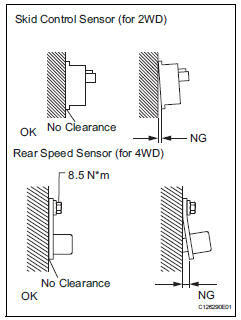 Check the speed sensor signal after the speed sensor clearing or replacement (see page bc-28). 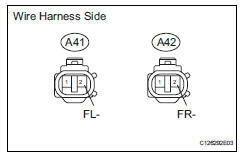 Disconnect the a41 and a42 sensor connectors. Replace the front speed sensor. Refer to dtc c0200/31 (see page bc-62). 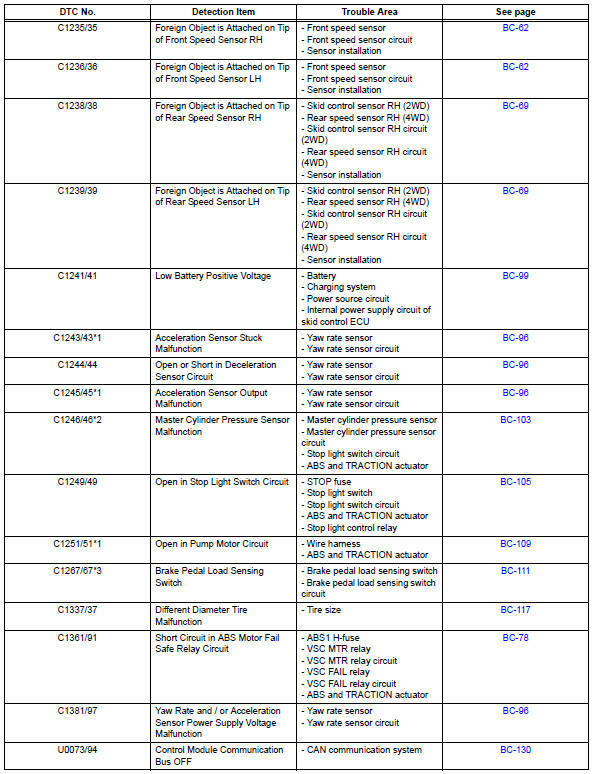 Dtcs c1273/73, c1274/74, c1277/77 and c1278/78 can be deleted when the speed sensor sends a vehicle speed signal or the test mode ends. 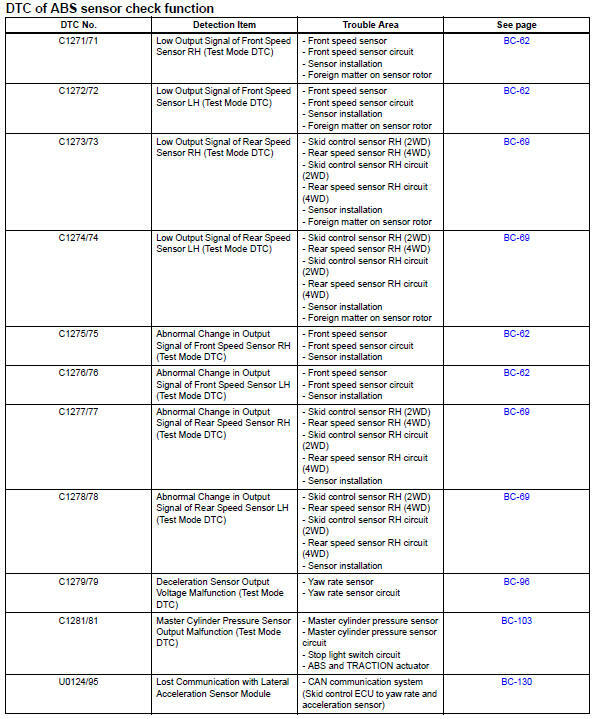 Dtcs c1273/73, c1274/74, c1277/77 and c1278/78 are output only in the test mode. 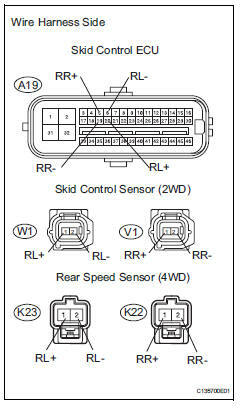 Dtc c0210/33 and c1238/38 relate to the skid control sensor rh. 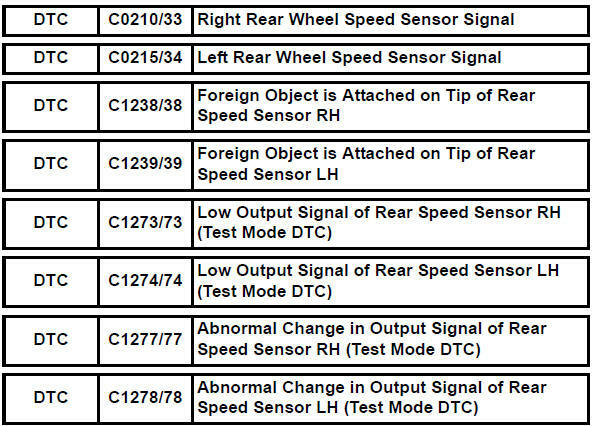 Dtc c0215/34 and c1239/39 relate to the skid control sensor lh. Using the data list of the intelligent tester, check for any momentary interruption in the wire harness corresponding to a dtc (see page bc-23). Perform this inspection before removing the sensor and connector. 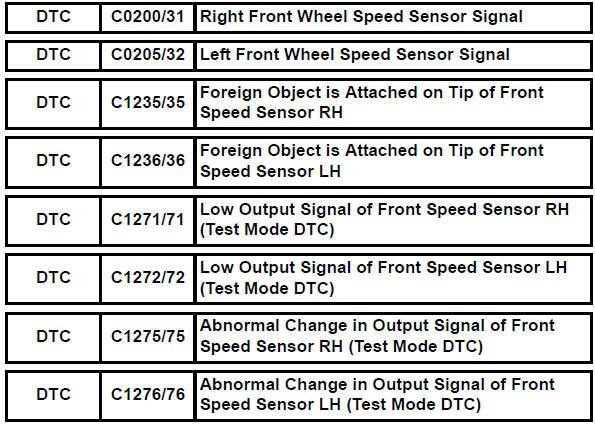 Check the data list for proper functioning of the rear speed sensor. Check the speed sensor installation. The installation bolt is tightened properly and there is no clearance between the sensor and rear axle carrier. Check the speed sensor signal after the replacement (see page bc-28). Remove the skid control sensor (for 2wd) or rear speed sensor (for 4wd). Disconnect w1 and v1 sensor connectors for 2wd. Disconnect k23 and k22 sensor connectors for 4wd. Disconnect the w1 and v1 sensor connectors for 2wd. Disconnect the k23 and k22 sensor connectors for 4wd. 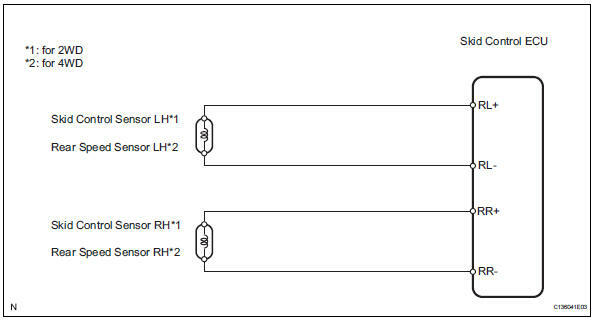 Measure the voltage of the wire harness side connectors. Replace the skid control sensor (2wd) or rear speed sensor (4wd).